I’ve been pretty forgetful lately, like I forgot to thaw some beef before leaving for work. “Tonight black pepper beef yeah?” he requested eagerly so I made a mental note to take it out of the freezer before leaving to work. Didn’t happen, so around 7 pm I left work to go to the groceries quickly. Got all my ingredients, got my precious beef, and off to the counter I went. “Forty five ninety, Miss.” I was told while I rummaged through my bag for my purse. Oh. My. God…. I left it in the office. Oh. My. God. Pleaseeeee let me find some cash or cards in my bag. Nope. None. I turned to the lady sigh-ing behind me and smiled sheepishly. Thoughts started running through my head and an idea came to my head. After the speedy explanation coupled with very red cheeks, the lady stranger paid for me and I whipped out my phone to transfer money online straight to her account on the spot. So that’s MY experience using Maybank2u. And I reckon it’d be a pretty awesome ad. Do you have a story of your experience with Maybank2u? Has Maybank2u saved your life before? 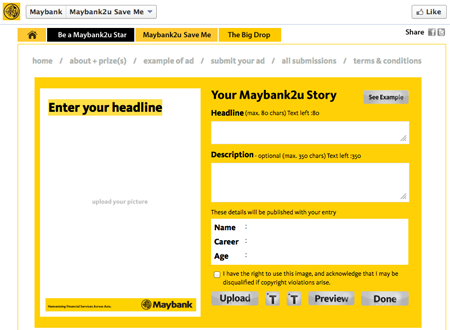 If it has, you might be able to convince Maybank2u to make YOUR story into their ad!!! Don’t miss this chance to tell the world about it. 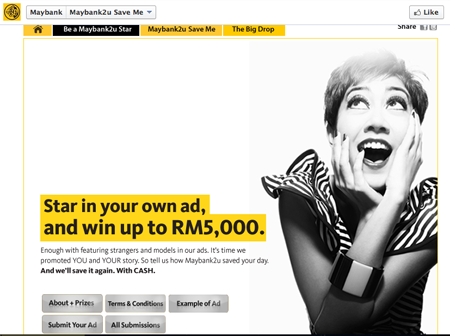 Maybank2u is running a competition “Be A Maybank2u Ad Star Contest”. They’re looking for an awesome true story that they want to make an ad on. 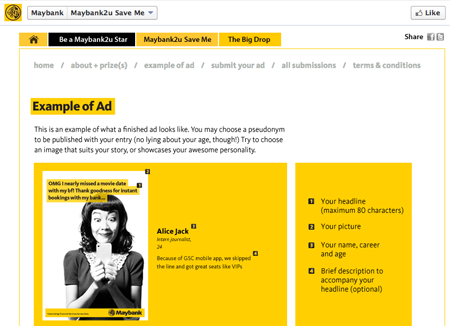 Win up to RM 5000 by creating your ad which can possibly be a Maybank2u ad! Multiple entries are allowed, and if you are a blogger you might stand a chance to win an Asus Nexus 7 Tablet. Check out the details here on what to write! So just fill in yours! You do not need to write a long story, just a headline with your picture and a brief description and you are done with the ad! Contest runs now till 31 December 2012. Good luck! V, nnu might wanna try mobile banking. Superfast and awesome! Even you do not registered recipient’s account number to your profile, can still send to his/her mobile number…. cools, rite?